READING, Pa. -- Freshman running back Chris Dawson wasn't supposed to be in the lineup on Saturday. Diagnosed with a fracture in his leg following the FDU-Florham game, Dawson headed home for the bye week and saw his doctor in Maryland. A second look at the x-ray revealed that Dawson did not have a fracture and he returned to campus with the news that he would be able to play against King's. That news paid big dividends on Saturday as Dawson raced 23 yards for a touchdown in the second overtime lifting Albright to a 30-24 victory over King's in Shirk Stadium. After both teams scored touchdowns on their opening possession of the first overtime, King's got the ball to begin the second overtime. and faced a 4th-and-2 at the Lion 5-yard line. Quarterback Tyler Hartranft carried the ball to the 4-yard line before lateralling the ball to Evan Foster who was tackled by Steve Barroso for a five-yard loss. On the Lions possession, Dawson carried the ball for two yards on first down and then raced 23 yards for the game-winning score on second down. He skirted around the left end and scampered down the sideline capped by a headlong dive into the end zone giving Albright its second straight victory. Albright improved to 3-4 overall and 2-4 in the Middle Atlantic Conference with the victory and ran its winning streak against King's to eight straight games. The Monarchs fell to 3-4 overall and 3-3 in the conference and saw its three-game winning streak halted. Dawson, who finished the game with 53 yards rushing, also scored the Lions touchdown in the first overtime period. Pat Wise started the drive with a 13-yard completiton to Vinny Williams, which moved the ball to the King's 12-yard line. Dawson then carried seven yards to the King's 5-yard line and punched it into the end zone on the next play putting the Lions ahead 24-17. King's answered the Albright touchdown when Hartranft found Dan Kempa from five yards out on 4th-and-2 to tie the score at 24-24, which set the stage for the dramatic touchdown run by Dawson. Wise finished the game 14-22 for 171 yards and tied his career high with two touchdown passes. 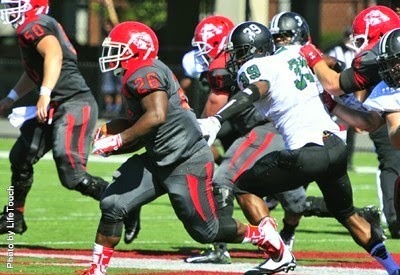 Williams caught six passes for 114 yards and Dan Grillo and Gerrod Gainer each had a touchdown catch for Albright. Daniel Sobolewski drilled a school-record 52-yard field goal in the third quarter, which topped his own school record of 51 yards set last season versus Stevenson. Sobolewski attempted a 53-yard field goal in the second quarter, which had plenty of distance, but hit the right upright. The play was wiped out on a roughing the kicker penalty on King's. Colton Ryan led the Albright defense with 14 tackles, while Barroso finished with nine tackles, two tackles for loss and an interception. After a scoreless first quarter, King's got on the board in the second quarter courtesy of the Monarch defense. Bobby Russell tackled Dawson in the Albright end zone at the 11:24 mark of the second quarter giving the Monarchs a 2-0 lead. The Lions took their first lead of the game when Wise found Grillo from 10 yards out with 2:09 to play in the opening half, which capped a 15-play, 89-yard drive. The Monarch defense again provided points early in the third quarter. An Albright fumble was recovered in the end zone by Anthony Martuccio and the ensuing two-point play put King's ahead 10-7. Sobolewski then tied the game at 10-10 when he drilled his school-record 52-yard field goal with 2:38 to play in the third quarter. The Lions went ahead midway through the fourth quarter when Wise hooked up with Gainer from 15 yards out capping a 10-play, 78-yard drive that put Albright in front 17-10. King's tied the score with 5:24 to play in the fourth quarter when Hartranft found Kempa from 53 yards out, which tied the score at 17-17 and forced the overtime. Albright will look to extend its current winning streak to three straight when it visits Wilkes in a Middle Atlantic Conference game on Saturday (Nov. 1) at 1 p.m.